The London Street Art Issue! 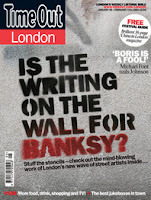 Thie newest issue of Time Out magazinge currently on sale is the The London Street Art Issue. It features articles on How graffiti became art, The future of London's street art and Artist's Profiles including D*Face, Eine, ID, The artist known as Caliper Boy, CutUp and Adam Neate. According to the magazine "Banksy no longer rules the streets when it comes to spectacular urban art. A new generation of artists are pushing the boundaries of the form – and seeing their works taken seriously by established galleries and auction houses. Time Out presents the inside track on this exciting scene, and showcases the best of the upcoming talent."